Aided by a magic pocket mirror, players must guide their trusty and adorable pink steed, portrayed by game designer Nick Crockett, through both in-game city streets and the real-life Hammer Museum courtyard. Created for exhibition at the UCLA Game Art Festival. 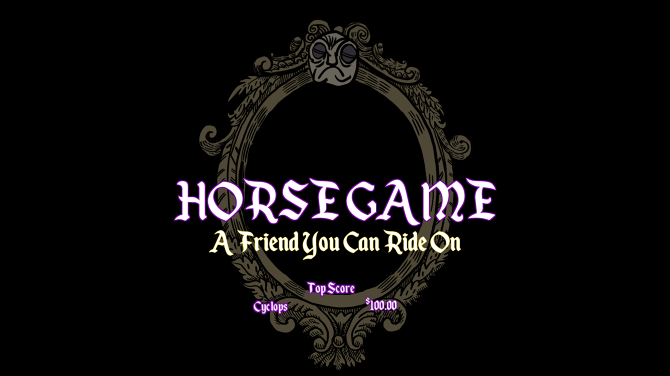 Horse Game: A Friend You Can Ride On is an arcade game and performance designed for the UCLA Game Lab Arcade Backpack. Aided by a magic pocket mirror, players must guide their trusty and adorable pink steed, portrayed by game designer Nick Crockett, through both in-game city streets and the real-life Hammer Museum courtyard. Players can use the joystick to examine a map of their surroundings, but must tell their driver – either by shouting or by shoving – which way to go. Turn miles into money by picking up animal-corpse-beings and shepherding them to their destinations in your taxi.